A dash cam can save you quite a bit of money and hassle in case of an accident, and is essential for any responsible car owner. This DashCam Hi-Res Car Video Recorder & Camera normally runs for $95, but right now Lifehacker readers can grab one for 70% off - just $26.99 with free US shipping. Dash cam footage is the best way to protect yourself from liability in case of an accident. 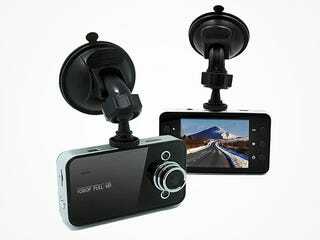 Simply turn it on when you’re driving, and it’ll record footage of the road on a continuous loop. If you ever find yourself in an accident, you’ll have video evidence to avoid protracted disputes with your insurance provider, in court, and much more. A dash cam is a must-own for any responsible car owner, but it doesn’t need to cost an arm and a leg. Get the DashCam Hi-Res Car Video Recorder & Camera for over 70% off today, just $26.99 with free US shipping.